Our THOR Load Bearing line of products has recently been further enhanced by the introduction of the new range of field-repairable accessory pouches, designed to reduce weight and enhance functionality. 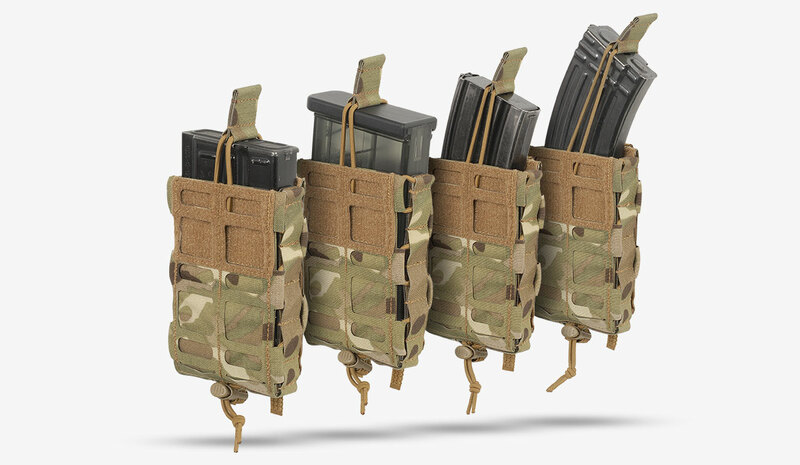 They offer a unique solution to the problem of multiple size magazines, accommodating both the AR (5,56mm) and BR (7,62mm) magazine models. The stackable pouch can be delivered as single, double, triple or quad, and the slot attachment system ensures the pouch is fastened securely. The square attachment interface repels water and dirt. The volume of the pouch can be regulated with the pull of a single cord, and the removable flap provides cover for your magazine. This unique combination of compression design and NFM proprietary fabrics is yet another great example of the high quality, maximum functionality that NFM products are known for.